The 9mm Luger is one of the best self defense rounds in the world, and since its debut in 1902, it has only gained in power an popularity. With the accuracy, effectiveness, and reliability that the 9mm provides, you have a great option for target shooting and self defense applications. 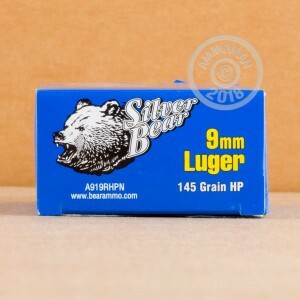 Getting its name from the color of it's casings, Silver Bear is one of the higher quality ammunition manufacturers in Russia. Their products are non-corrosive, accurate, and affordable, making them perfect for volume shooting at the range. 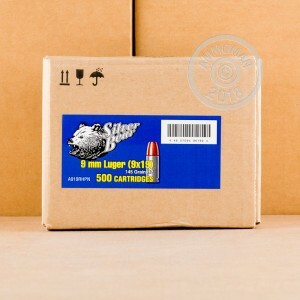 This new production ammunition is loaded into zinc plated steel cases that are berdan primed and not re-loadable. Each projectile in this bulk case of 500 is a 145 grain, bi-metal hollow point that will stick to a magnet. 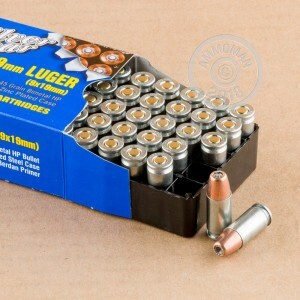 Order this case of 9mm hollow point ammunition, or any other products over $99 and you will receive Free Shipping from AmmoMan.com!